It all started when I got up to pee (like always when you’re almost ten months pregnant) around 1:40am July 20th. When I returned to bed, a thread from our curtain had gotten caught in our little fan making a strange loud noise, which caused me to wake DJ out of alarm. He checked to see what it was, when I felt a pop, and suddenly Niagra falls made it’s way onto our bed. At any rate, that’s what it felt and looked like... (Thankfully we had prepared for such a situation and laid plastic under our sheets). Contractions began almost immediately, but I went to the bathroom and curled my hair because I didn’t want to look totally awful during labor (insert eye roll here). That adrenaline faded quickly and contractions became much more intense. My mom showed up shortly after, and quietly did her job as being peaceful mama. Her presence alone was a huge help. We called our midwives (Pauline + Mary) and updated them on progress, and they arrived a bit later. They set the atmosphere by diffusing essential oils, and playing soft worship music all throughout our home. It was beautiful as the morning light began to flood through all our windows. Contractions were consistent and intense for hours without too much physical change, so Pauline suggested eating and walking a bit. Mentally, I really anticipated a short labor. My friend who had also gone into labor past 41 weeks and had home birth only had a three hour labor, and with all the prodromal labor I had, I thought for sure I’d be delivering while it was still morning (don’t do this mamas. don’t have expectations like this…it really isn’t worth the mental battle). Not so. I didn’t want to eat. I was mad that things weren’t progressing. I wasn’t hungry and I was tired (we had gone to bed past 11, and this all started at 2am). We were encouraged to sleep, but the pain was too much to sleep through contractions. I ate some nibbles of my favorite breakfast, then battled my mind to push through and really try to move things along. I agreed to walk around the block with DJ. Initially I had declined going outside while laboring because we live in Midtown, and walking by people while getting through contractions did not sound appealing (have you SEEN a mom laboring unmedicated?! ), but I was so ready for things to really move forward. Truly, everything was a mental battle for me. DJ (being the supportive and amazing husband he is), knew my goal and my heart…so he so graciously made me walk through the contractions without stopping, and this is what finally got things to move forward. I was so scared to truly feel the pain; to really experience what was happening, which was holding back progression for Nora to make her way out. We did this a few times, going back inside for breaks every now and then. We took a shower, DJ took a nap, and then I went in the warm tub of water. I was exhausted. At this point, I had been laboring 10+ hours on very little sleep and intense emotional and mental roller coasters. I was in it. This moment that I had been waiting for… it seemed so close but so far. I napped between contractions (yes, two minute naps are possible when you’re that tired, ha), and decided to go for another walk around the block. I wanted so badly for this part to be over, and for my babe to be in my arms. By mid-walk, I knew I needed to push. We went back home, Pauline had me get in some laboring positions on our bed that would make contractions much more intense (thus working Nora down stronger), and I ended up throwing up what I had eaten early that morning (yuuuck)… but this was the sign that put me back in the tub, and shortly thereafter started pushing. Holy. Moly. Pushing a baby out is hard! (A little background: I had been experiencing prodromal labor for the last few weeks, and was 10 days past my due date. Nora had been very low and head down for months. It didn’t make any sense to us why my body was taking so long to get her out, and I was getting nervous about needing a hospital induction or c-section. These aren’t bad things, just wasn’t what my heart wanted for us). It was in the middle of pushing her out that Pauline realized she had a compound arm, meaning her fist was at her face and keeping her from coming out. With one giant push Nora came out all at once! All three of us went to grab her, and there she was. Our beautiful 9lb 8oz girl was finally in our arms at 5:13pm, after 14 long and hard hours of labor. We literally loved her from the moment our eyes met. Her eyes were wide open and looking right at DJ and I. It was truly the most amazing feeling. Indescribable! The moment we had been waiting for, for so long. 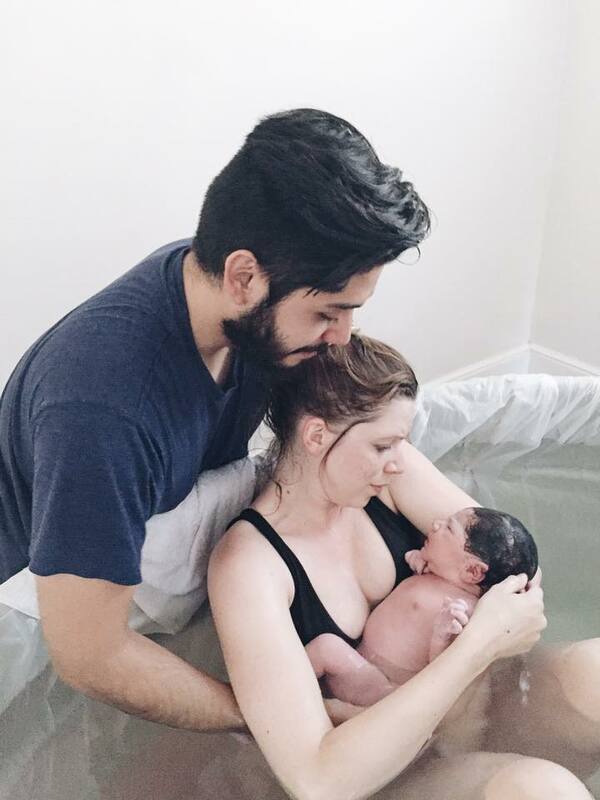 We are incredibly grateful to our midwife team (abidinggracemidwifery.com) for all the love, support, and graciousness through this whole process. Going for a home birth was a fairly last minute decision as we felt God lead to us to this. They have been an amazing support for us during this time, and we are thankful the Lord led us to them. We are now 6 and a half weeks in to this parenting thing, and can’t even believe this love. It’s like no other. We still look at our Nora Jane in awe and wonder (even with her shrill velociraptor cries when she reeeeally doesn’t want to nap haha). Thanks for reading our story. It's honestly a lot different than I expected it to be, but beautiful, and perfectly ours. I am grateful we were able to safely deliver our healthy baby here in her first home. What an amazing gift! We are grateful God gave us this experience. Though the hardest thing we’ve experienced, it’s strengthened our marriage and helps us understand God’s love just a touch more. He is good, and His timing is perfect.